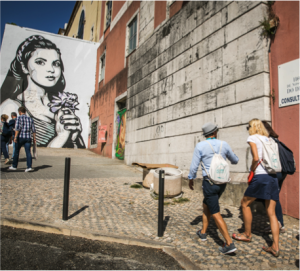 CEMR recently participated in the URBACT City Festival in Lisbon (13-14 September) and co-organised a Gender Equal Cities “Walkshop” to analyse the urban landscape with a gender perspective. ‘Gender Equality’ has become one of the political zeitgeists of 2018, prompting institutions around the globe to take a closer look at how women and men interact in personal, professional and public spheres. But what does it mean for European cities? The new URBACT initiative, Gender Equal Cities, sought to provide some answers to this complex question at the URBACT City Festival in Lisbon this month. In a half-day Walkshop we undertook a live place analysis of the city asking how and why women and men experience public space differently. And more importantly, what can be done to create safe, inclusive and Gender Equal cities? As we set off in the mid-morning heat the city of Lisbon unfolded around us in all its gendered complexity: elderly women were lugging heavy shopping up steep cobbled streets, taking breaks, leaning against the white washed walls, trying to find some shade. One of the many young women tuk-tuk drivers whizzed by. She was guiding a group of tourists through the chaotic traffic of trams, buses and cars, nearly all of which are conversely driven by men. The male construction workers and police officers occupied the pavement, smoking their 11 o’clock cigarette. Often their gaze followed her. As she moved through public squares, mothers with children play at the foot of statues of military men and the colonial past, it may not even have occurred to the tuktuk driver how this environment may have impacted her ambitions, interests or finances. This is perhaps a less often considered perspective of city life and one that URBACT’s new initiative, Gender Equal Cities, seeks to explore. 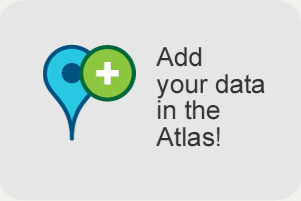 We know that cities are the level of government closest to the daily needs of citizens. They frequently constitute the largest local employer and have substantial control over public services. All of these factors provide opportunities for action to overcome gender inequality, but a short walk through the city revealed that obstacles persist. From poor street lighting that might make women feel unsafe to negative stereotypes reproduced by sexist advertising; from public statues celebrating machismo to mobility that prioritises motorised vehicles over pedestrians; it’s not difficult to see how disabled women, parents and the elderly might struggle in the city. Identifying these problems however, is the necessary first step to solving them. 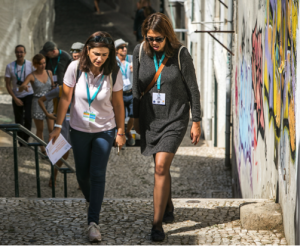 The 40 European urban professionals that joined our walk around Lisbon shared insights, often connecting their observations to experiences in their own city. During the feedback session some women talked about strategies they have developed to move safely around the city, such as avoiding different streets, taking longer routes, and modifying their own behaviour by, for example, dressing differently to avoid harassment or violence. One group remarked on the different representation of women and men in the public spaces noting how roads are often named after famous men and the only women that appear to be worthy of street names are Saints and queens. Another group debated the gender perspective of the very visible Lisbon tourist boom. Who owns the assets now capitalised via Airbnb? What kind of jobs are created for women? What is being done about the diminishing space for families in the city centre? The Walkshop demonstrated the need for a participatory approach to gender sensitive planning. The Portuguese NGOs present including the Portuguese Platform for Women’s Rights, Women Without Borders and the National Association of Women’s Architects, highlighted that cities need to reach out to them more often, to recognise the particular expertise on gender equality that they can bring to the table across policy areas. NGOs work closely with women from all backgrounds, socio economic groups and ages. They are uniquely positioned to consult them about their needs in the city. At a basic level this is a question of representation: women’s experiences and voices must be represented in local government and planning to fulfil their “right to the city.” This basic need for representation, consultation and data disaggregated by gender was emphasised by all. These are processes that civil society is often uniquely positioned to support. Thanks to the URBACT Best Practice example from Umea, Sweden we know what this looks like in practice and that it works: to help women take back public sports spaces the city undertook a comprehensive consultation and discovered that women-only spaces are sometimes needed. As the National URBACT Point from Sweden pointed out, simple things like more street lighting and lowering park benches are inexpensive and easy ways to democratise public space by learning from grassroots. Women from The Portuguese Platform of Women’s Rights, the Association of Women in Architecture and Women without Borders also emphasised that this relationship must be mutual: to achieve gender equality NGOs need cities as much as cities need NGOs. To find solutions to the challenges observed in Lisbon, and prevalent in most European cities, we moved into a discussion about the role of local, national and international frameworks. We were fortunate to be joined by regional representatives from European networks including URBACT and the Council for European Regions and Municipalities (CEMR), local politicians and national women’s groups. We heard from Teresa Vicente, responsible for Equalities in Cascais, a signatory of the CEMR European Charter for Equality, about how their work on gender-sensitive communications training and tackling domestic violence in young relationships ties in with the global women’s rights movement. From each actor the message was clear: we need each other. We need to work together and support each other. For gender equality to be meaningful, sustainable and inclusive of multiple axes of discrimination we have to be smarter in connecting local initiatives with European and global networks. Documents like the CEMR’s Charter for Equality, along with SDG 5 on Gender Equality provide the necessary high level political will to keep the momentum going and hold cities accountable for cultivating gender equality. At the Walkshop it became clear that cities have a role to play in translating these documents for their citizens, to remove language or jargon barriers and apply their messaging to the local context. National level networks and exchanges can also promote learning about what works to create gender equality in different cultural contexts. The city has many tools to use in the pursuit of gender equality. 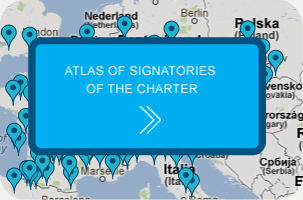 The 30 articles of the CEMR European Charter for Equality clearly explain tangible action cities can take. As an employer it can prioritise equal pay, flexible working, career progression for women; as a public service provider it can consult women to ensure services are designed with all citizens’ needs in mind; and as an educator it can play an integral part in deconstructing negative gender stereotypes. What we learnt in Lisbon is that when we open our eyes we find evidence all around us of why and how the city is gendered. We also learnt that the city has a key role but cannot act alone. By becoming an effective intermediary between the global goals, the European agenda, national and local level policy, grassroots activism and women themselves, cities can make progress towards inclusive cities for all.